God is dead. Everything breaks apart. 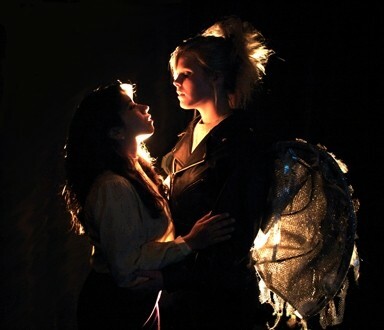 ANGEL’S KISS : The play’s title character, played by Anna Acuña, shares a sexual attraction with her guardian angel, played by Ellen Jones. The play was written in 1992 by Jose Rivera, a Puerto Rican playwright and screenwriter whose works include the screenplay for Motorcycle Diaries. The title character, Marisol Perez (played by Anna Acuña) lives in a world where apples and coffee are extinct, the moon has abandoned the Earth, natural and human disasters have wiped away huge segments of the population, and the government jails and tortures citizens who are overdue on their credit-card payments. In short, the apocalypse is coming, a preoccupation that reflects the pre-millennium apprehension circulating throughout the ‘90s, when the play was written. And it’s not pretty. Skinheads regularly set homeless people on fire. Sexual assault and homicide are as commonplace as cereal at breakfast. And men brandish golf clubs and ice cream cones at unsuspecting women. In order to make the violence on stage as realistic as possible, Anderson hired fight choreographer Peter Hadres, a resident actor at PCPA. In this world, Perez will struggle to survive and to come to terms with her spirituality and sexuality. Acuña hasn’t acted in a play since her elementary school production of A Christmas Carol, but she immediately identified with the character’s conflict. She too, is a Latina woman who has faced doubts over her Catholic faith. The character’s sexuality takes an interesting turn when her angel (Ellen Jones) appears—streetwise and clad in leather and luminous wings. God is senile and dying, she reveals, and the angels have banded together in revolution to destroy him before he can destroy the world. Unfortunately, the angel cannot both battle God and protect Marisol. She appears in Marisol’s bedroom to deliver a wake-up call: “You have to fight. You can’t just endure anymore. You can’t trust luck. And prayer. And mercy. And other people. So get yourself some power, Marisol.” The angel’s directive to Marisol is intended for the audience as well, to jar them from the complacent lull of a cultural faith that keeps people quiet and well behaved. Rivera isn’t dealing with such specifics as one kind of religion or God, so much as a broader faith in government and capitalism. Anderson has an enduring interest in social theater. Her doctoral thesis concerned AIDS and theater. And she’s asking her students to take an active interest in the social issues discussed in the play, such as environmental catastrophes, homelessness, and mental illness. She started a Facebook thread where the students post links to relevant news stories, about anti-government protests in Thailand, white supremacy, attacks on immigrants and the homeless. In particular, homelessness is a central theme in the play. Marisol first learns that the guardian angels are abandoning their people when a homeless man confronts her about it on the subway. His panic reflects his vulnerability, not only to the elements but to the Nazi skinheads that wander the park and set homeless people on fire. “I live on the streets. I’m dead meat without my guardian angel,” he points out. A HISTORY LESSON: Cal Poly Theatre Department’s production of Marisol runs May 13, 14, 15, 20, 21, and 22 at 8 p.m. Tickets cost $15. For more information visit pacslo.org. Rivera plays with another kind of homelessness as well, beyond the widespread cardboard box homelessness that persists in virtually every city and town in America. This other homelessness is about the displacement of living on a planet that is becoming unrecognizable, the kind of dread and fear New Yorkers must have felt after 9/11 when a familiar landmark disappeared. Rivera takes this evolution to the extreme; between Act 1 and Act 2 the world as Marisol knows it disintegrates, leaving something unfamiliar and illogical in its place. But Rivera poses another option as well. Marisol’s friend’s brother, Lenny, calls this new world a “frontier,” a word that has always carried potential unknown terrors, but which is significantly less fearful than apocalypse. There are choices in this frontier, though they may not seem desirable. Mentally ill and violent Lenny offers to be Marisol’s mate in this new world, the possibility of a baby. “I can carry the knife for you,” he says, of the weapon that resides under her pillow. Lenny’s sister June offers Marisol a similar proposal. They can live together, and June promises to clean the chemicals off the food. Though the play has all the makings of a tragedy—the apocalypse, violence, despair, skinheads—Anderson insists that Rivera manages to extract a ray of hope. In fact, Marisol ends the play on the words “what light, what possibilities, what hope.” Beyond that, the proverbial ball is in the audience’s court. They can return home and sip lattes and trust the powers that be. Or they can question. Anderson is hoping that the former isn’t much of an option, and Kyle McCurdy, who plays man with golf club, man with ice cream, and man with scar tissue explains why. Arts Editor Ashley Schwellenbach also can carry knives and clean chemicals off food. Send post-apocalyptic love letters to aschwellenbach@newtimesslo.com.